Openfire Meetings version 0.1.5 has a new meeting planner feature that enables you to schedule meetings in advance using a calendar.When you add a meeting to the calendar, a request to join the meeting is automatically generated and sent to each participant using Openfire’s email service 15 mins before the meeting starts. 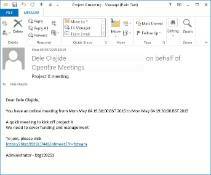 Included in the email is a link to join the meeting from a Chrome web browser. This would be awesome if there were an API so anyone could schedule this without access to openfire admin. 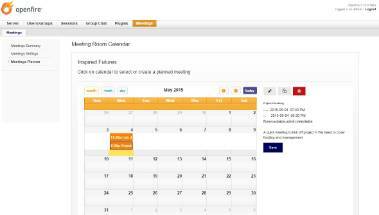 With an API this feature could be a plugin to spark and the “clients” could be scheduling a meeting by a calendar in their IM, and received in their outlook when the time has come. That is a very good idea. 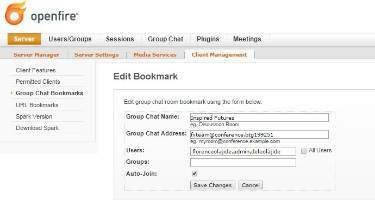 It should be fairly straightforward to modify the focus user to accept chat messages and use them as instructions to schedule a meeting. Focus user would become a bot, checking permissions and performing actions. First of all thanks for nice community and off course the project. My question is with current version of smack is it possible to plan the meetings like this as mention in your comments above ?